The Center for Biological Control was formally established in 1999 as one of the Research Centers within the College of Agriculture and Food Sciences (CAFS) (formerly College of Engineering Sciences, Technology and Agriculture (CESTA). 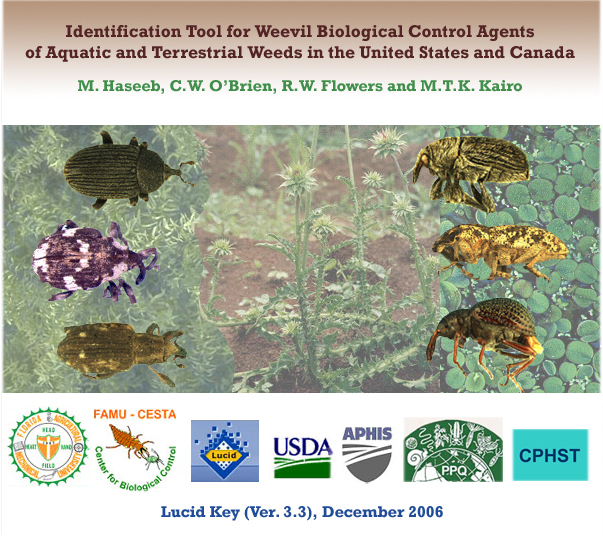 However, biological control research had been ongoing in CAFS since 1976 with significant contributions being made to the taxonomy of weed biological agents and other areas. The Center is made up of a unique partnership between Florida A & M University, the Agricultural Research Service (ARS) and Animal and Plant Health Inspection Service (APHIS) of the United States Department of Agriculture (USDA). Both agencies have placed fulltime faculty to work cooperatively with university faculty. The mission of the Center is to generate, apply and transfer innovative, ecologically based solutions to pest problems affecting agriculture, natural resources, and human health while developing the human capacity for continued future innovation. During the first five years of operation, the Center has made great progress in training, research and outreach. Faculty resources and portfolio of activities have expanded, providing more opportunities for training and research. The Center is now well positioned to expand and continue delivering positive outcomes by addressing some of the most significant challenges facing the world today and thereby fulfilling its vision of securing food, natural resources, and human health. Events during the first decade of the new millennium brought into sharp focus important issues regarding the security of our food, natural resources and health. Among some of the key issues are: the growing threats from invasive alien species and increasing demand for the production of safe, high quality food using methods that do not impact negatively on the environment. The establishment and proliferation of invasive alien species due to globalization of trade and transport is increasing at an alarming rate. This risk is particularly high in Florida due to the large volume of commodities and passengers passing through the state’s ports. While p revention is the most effective strategy for dealing with these growing threats, it often requires concerted action with trading partners to minimize the risk offshore. Inadvertently, some species will escape and become established requiring mitigation efforts. In many such situations, biological control is often the method of choice. This tool was developed in 2006 and is based on the LUCID KEY program Version 3.3, links to the CD image and programs are below. With research into the pests of bees to teaching about insects at local schools, FAMU spreads the word about the importance of the small wonders of our world.